The Kirk Ferentz era hasn’t exactly been like a bad dream that Iowa fans keep having over and over again, no it’s more like an average dream. Ferentz also might be one of the best survivors in college football with his uncanny propensity to win just enough to keep his job again and again and again. However, the rumblings about Ferentz’s inability to take this program a step forward have picked up over the last few years, so that win threshold that the Hawkeyes need to clear may be moving higher, and just out of Ferentz’s range. Welcome to football season in Iowa, a.k.a. the glitch in the matrix! Iowa, much like Wisconsin, is probably best known in the football world for its typical Angus-fed, road-grading offensive line. Even with both tackles gone, including 5th overall pick Brandon Scherff, the offensive line is widely considered the strength of the offense heading into pre-season camp. 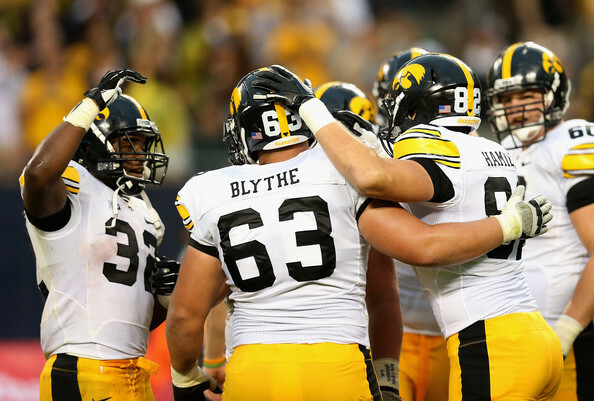 Both guards and 2nd team All-Big Ten center Austin Blythe return for a line that should be able to both open holes in the running game and keep the quarterback on his feet. Speaking of quarterbacks, C.J. 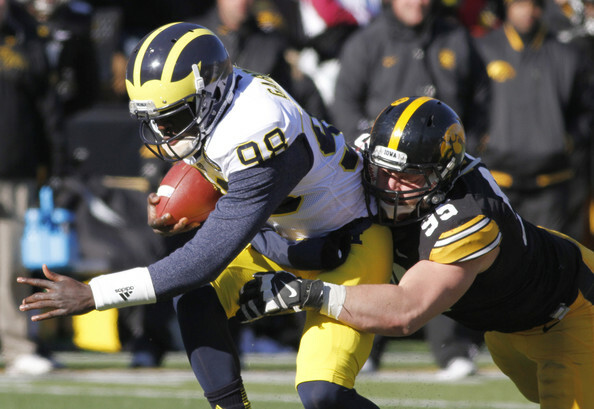 Beathard is now the man at quarterback with Jake Rudock’s decision to transfer to Michigan. Beathard was Rudock’s backup last season, but many fans felt that Beathard had more upside and the team’s ceiling would be higher with him at the helm. That theory will be put to the test in 2015, or at least that appears to be in line to happen. Beathard was decent, but not spectacular in his nearly 100 pass attempts last season, completing 56.5% of his passes for five touchdowns and two interceptions. The guys on the other end of Beathard’s throws are the biggest upside players on the offense, though. Tevaun Smith caught 43 balls for over 600 yards last season, and did that while catching better than 60% of his targets. That is a pretty good combination of both possession and deep threat receiving statistics. Smith should lead the way for the receiving corps in 2015, but expect help from guys like Matt VandeBerg, Jason Hillyer, and TE Jake Duzey to make significant contributions. VandeBerg, in particular, is an intriguing prospect after catching 14 passes for 256 yards in a reserve role in 2014. I believe he could emerge as a solid deep threat for the Hawkeyes this season. Most of the question marks for this offense center around the running game, and more specifically the running backs. Jordan Canzeri is the leading returning rusher with 102 carries for 494 yards in 2014. That’s decent, but not spectacular. He also failed to find the end zone on the ground last season. He was the backup last year, so it’s not like he was a primary back who never scored, but still in 102 carries you would think one of them could lead to a touchdown right? Admittedly, I’m not familiar enough with their offense, nor did I pay close enough attention to the film to notice what his red zone usage looked like, but I can’t imagine that he was completely devoid of red zone touches either. Anyway, expect Canzeri to score infinitely more rushing touchdowns in 2015, whether or not that means an improvement in the overall running game or not remains to be seen, however. Drew Ott and Nate Meier ought to make up a formidable pair of ends for this Hawkeye defensive line, but the question of who will line up between these two is both a tough question to answer and a potential problem. Carl Davis is gone, as is Louis Trinca-Pasat. Those two were a highly productive and talented duo in the middle and won’t be easily replaced. Jaleel Johnson and Nathan Bazata are the most experienced returning tackles and were listed atop the post-spring depth chart, but they combined for only 8.5 tackles last season. One place that Iowa will have no problem filling in experienced and productive players is in the secondary. Both starting corners and a starting safety from last years team return, including CB Desmond King who had three interceptions last season. Besides the three starters back, the top two backups at both cornerback and safety are also back. Sophomore Miles Taylor, who saw limited action in all 13 games as a true freshman, was the other starting safety on the post-spring depth chart next to returning starter Jordan Lomax. Iowa does return two starters at linebacker, but neither were especially productive last season. Bo Bower had his moments with 5.5 tackles for loss and two interceptions, but he and other returning starter Josey Jewell only had two combined sacks. Jewell’s only tackle for loss was his one sack, and he was a full-time starter. These two appear likely to be joined by Ben Niemann who had seven tackles, 1.5 for loss, in 13 games as a true freshman last season. Another year, another predictably middle-of-the-road finish should be in store for the Hawkeyes. This team is talented enough that with a very manageable schedule they should have no problems reaching bowl eligibility. 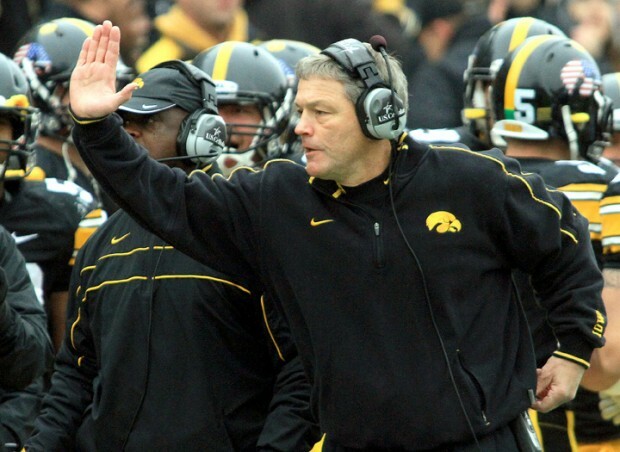 The most intriguing question surrounding this program going forward is what exactly the bar is for Kirk Ferentz. So far, being merely average has been good enough for Ferentz to keep his job, but will that remain the case or has the grumbling of the fan base actually raised the bar that the administration has set? Your guess is as good as mine as far as that is concerned, but my best guess is that 9-4 would probably bring Ferentz back for an 18th season in Iowa City. If they go 8-5 or worse though, it starts to get dicey for Captain Kirk.